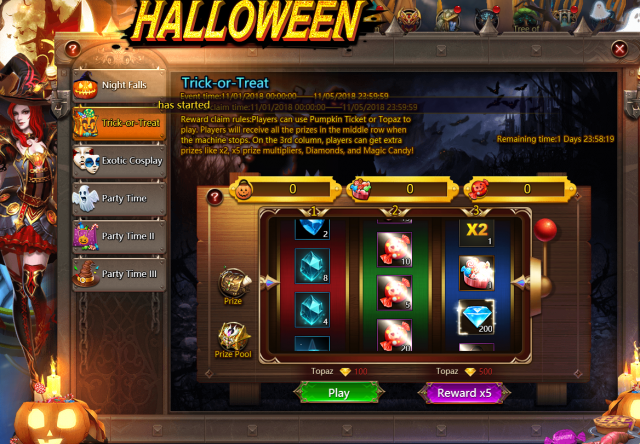 Welcome to Halloween Party in League of Angels III! The spooky party is about to kick off! All players are invited to the annual Halloween party of League of Angels III. From November 1st to November 6th, blitz the elite dungeons to obtain Fruit Candies, unlock the Witch’s Broom, dress up as vampires and witches, and let’s party! When the night falls, kids have dressed themselves up and get their tricks ready if you haven’t prepared the candies yet. From vampires, witches, zombies to ghosts and things that you can’t clearly recognize, you’d better watch out when you are at parties or on your way to parties. Trick or treat! From November 1st to November 6th, use your Pumpkin Ticket and Topaz to spin the wheel and you’ll be able to win tons of resources and exclusive tokens like Magic Candy and Fruit Candy, and even Pumpkin Ticket. The 2X, 5X rewards will be come out randomly if you are lucky enough! Plus, Fruit Candy will also drop randomly from elite dungeons during the Halloween party. Don’t be late! Who will be the dressing king/queen of Halloween? The Crimson Masquerade is the No.1 option for people across the Grace Continent when they are celebrating Haunting Eve, i.e. Halloween party. By exchanging the Fruit Candy and Magic Candy, you’ll be able to unlock the special Crimson Masquerade (permanent, body and head) and dress up as vampires or witches to show off! From Oct. 31st to Nov. 6th, login game every day and complete the required tasks, you will be able to unlock the Witch’s Broom and possess it for 10 days. Don’t miss it out! All League of Angels III US servers will have their clocks 1 hour backward on Sunday, Nov. 4. At 2 A.M., the server time will directly change to 1 A.M. Be sure to participate the events in time on that day! 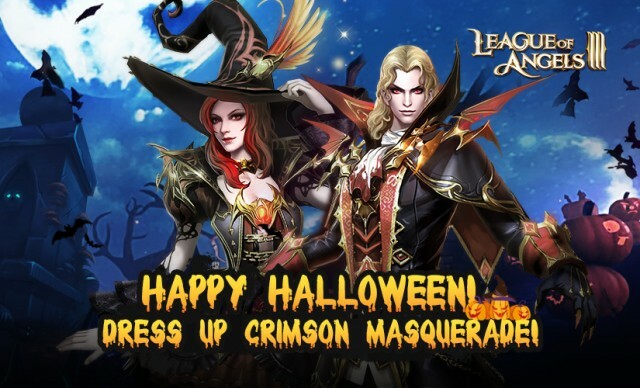 Play League of Angels III now and have fun in the Halloween party!